Big milestone birthdays deserve a bigger celebration and extra sweets! That's why this birthday card contains six special cupcakes that were created for someone turning 30! These cupcakes were made with white and pink frosting, birthday streamers, happy birthday text, and of course, the number 30! 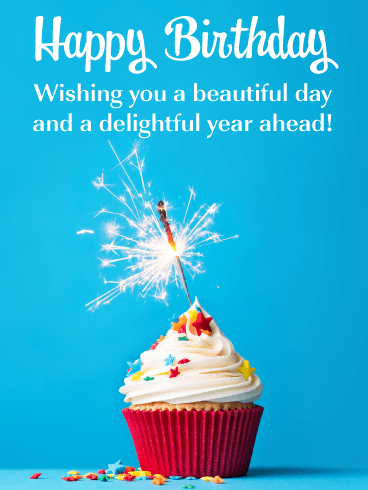 Send this wonderful birthday card to the person you care about today so they can enjoy a cupcake on their special day! Happy Birthday - Birthdays are always special but when you reach an important milestone such as this, it means a bigger celebration, a lot more presents, and extra sweets! Get the party started with this festive party hat birthday card! It showcases colorful birthday party hats and ribbons which is everything that would make a birthday celebration complete! It also features wonderful vibrant colors of pink, blue, and yellow! Be sure to send this awesome birthday card on its way so these party hats can be used on their special day. 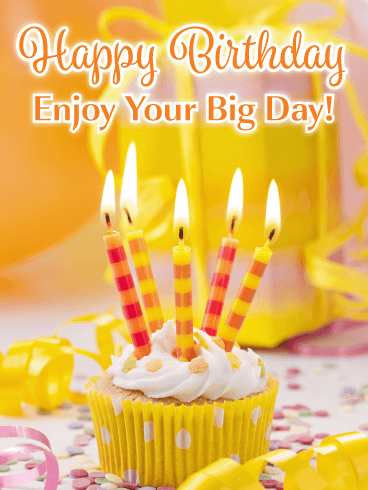 Send a burst of excitement to anyone celebrating a birthday with this stunning greeting card! It was designed to add happiness to those who receive it. 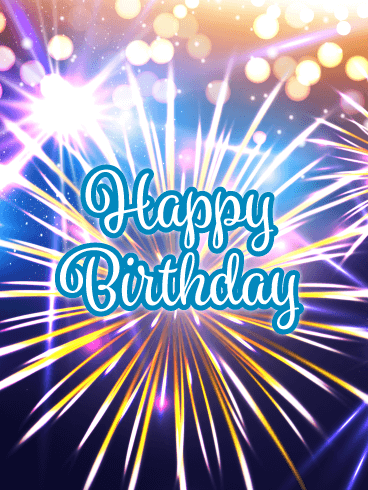 This birthday card features fantastic fireworks bursting in the air along with spectacular sparkling lights. Very exciting! The happy birthday message was created with fancy lettering to add a stylish element to this amazing birthday card. Send these dazzling fireworks out to help make someone's birthday shine! A good glass of wine will add joy to anyone's birthday, and this birthday card has plenty of them! Wish someone a happy birthday with some class with this exceptional greeting card. It features an outstanding image of perfect wine glasses lined up and ready for the party to start! 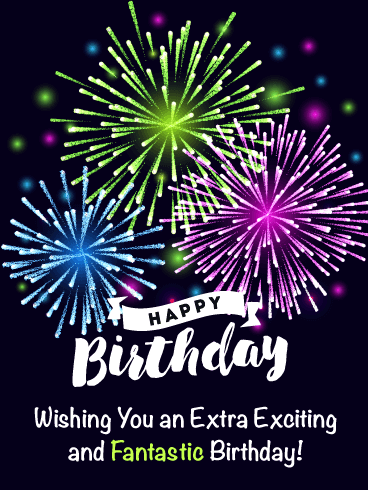 So be sure to wish someone an exceptional time and a terrific year with this greeting card that recognizes that their birthday is finally here. Send it soon before the wine is gone! 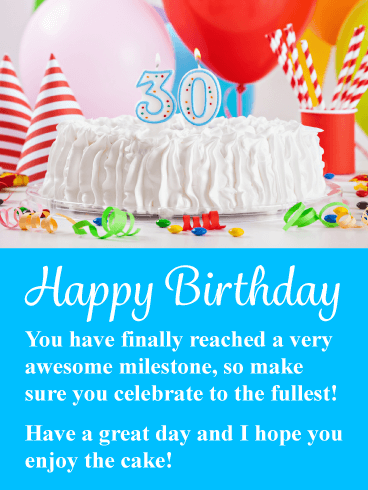 Send an eye-catching birthday card to someone in your life that is turning 30! This great greeting card has an amazing pink cupcake that looks perfect with this greeting card’s pastel pink and blue colors. 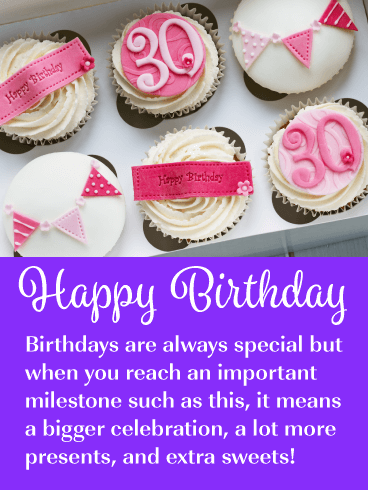 The special cupcake represents a 30th milestone and will put a smile on the face of anyone who receives it! Let someone know that you hope their birthday is as wonderful as they are by getting this birthday card to them today. They will be so happy you did! 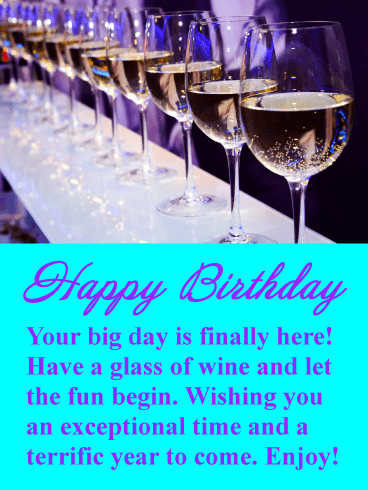 If you know an awesome person that you would like to wish a happy birthday, then we have got you covered! This fabulous birthday card will certainly add some joy to someone's big day. It displays festive birthday balloons surrounded by colorful stars, along with a thoughtful message! They will read that you think they are important and that you want them to have a great time on their special day. Send this impressive birthday card out today so they will receive these wonderful balloons without delay! The time has come to celebrate to the fullest because that's just what you do when you turn 30! This birthday card will remind the person you know just how awesome this milestone really is! It will also get them excited about their birthday when they see this wonderful birthday cake that features the number 30! Birthday balloons, party hats, and ribbons are also featured in honor of their birthday. Send this festive card their way to wish them a happy 30th! 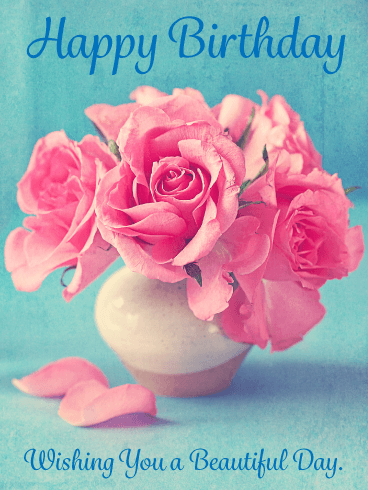 Make someone feel special today by sending them this delightful birthday card! Sparkling balloons and streamers set the stage for this remarkable greeting card and it looks fantastic! 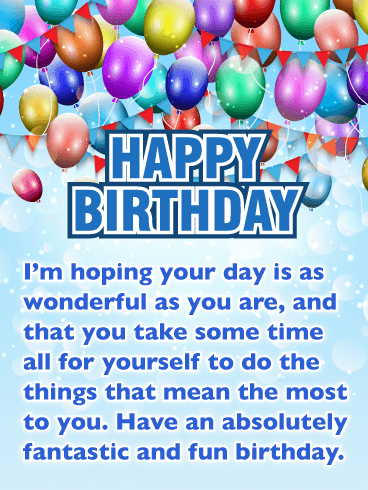 The birthday message will let them know that you think they are wonderful, they will certainly enjoy reading this! 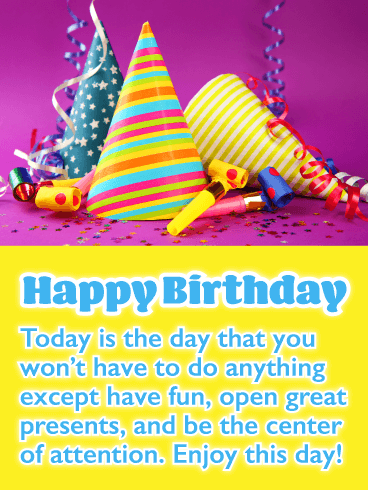 This birthday card will also wish them a fantastic and fun birthday, something everyone would hope for. Send these balloons and sparkles on their way to make sure someone has a great day! If you know someone who is celebrating their birthday then we have the perfect birthday card for them! This greeting card features an exceptional sparkling cupcake with irresistible frosting, as well as a vibrant blue background. It looks wonderful and will be sure to make any birthday the best ever! 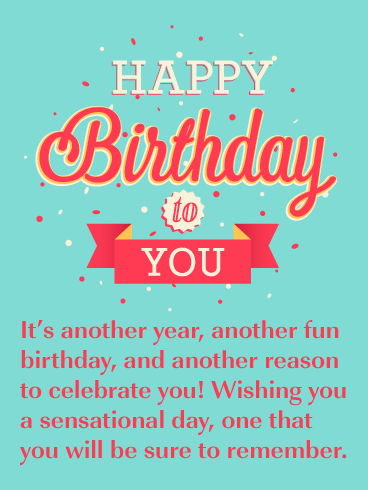 Wish someone a beautiful day and a delightful year ahead with this outstanding birthday card today! Birthdays come every year, and that just means it's another reason to celebrate! Let someone know that you are thinking of them with this outstanding birthday card! It features special fancy happy birthday letting, perfect colors, and confetti! 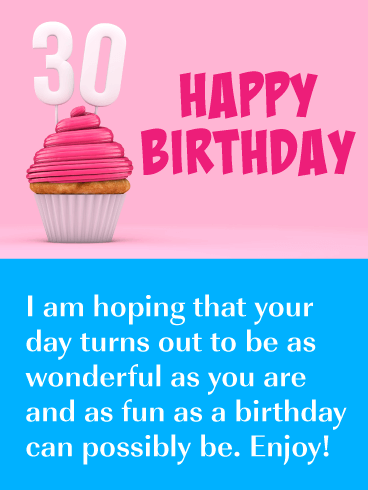 This birthday card will let you tell the person who is celebrating their birthday that you would like them to have a day that they will always remember! Send this awesome birthday card out today so someone can have a sensational day! Give a bright and happy birthday card to someone you know to make sure they enjoy their big day! This greeting card displays a lovely bright yellow cupcake with birthday candles that are lit and ready for the party to start. It also features birthday ribbons and confetti. Very festive! Send this splendid birthday card soon so they can blow out the candles and make their wish. They will be so glad you did!